The central idea of Judaism involves a commitment by the Jewish people to a single, omnipotent, incorporeal God, who is the creator and ruler of the universe and the source of a moral law for humanity. The idea of God as the creator of the universe opens the Biblical narrative Bereshit (“In the Beginning”) in the Book of Genesis. “Hear, O Israel, the Lord is our God. The Lord is One. Rabbi Moshe ben Maimon (1135 – 1204), commonly known by his Greek name, Moses Maimonides, was a rabbi and physician, as well as the author of a number of important works of philosophy, law and medicine. 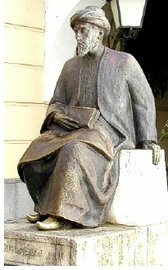 Born in Cordoba, Spain, Maimonides fled Muslim persecution of the Jews there and eventually became physician to Saladin, the Kurdish ruler of Egypt. Maimonides promulgated “The Thirteen Principles of the Faith”, which sets out his version of the fundamentals of Jewish belief. The Thirteen Principles appear in various forms in the Synagogue service, but it is important to note that they are not prescribed as dogma in Judaism, as similar pronouncements may be in the Christian tradition. For example, Articles 12 and 13 are not officially accepted by Conservative and Reform Jews. 12. I believe with perfect faith in the coming of the Messiah. However long it takes, I will await His coming every day. www.jewfaq.org/moshiach.htm on an Orthodox concept of Messiah and www.jewfaq.org/olamhaba.htm on Orthodox views of life after death.